There are things I don't like about meatloaf. Ketchup is number one. I don't like it on my fries. I surely don't like it on my entrees. Meatloaf is also up to individual interpretation. Maybe breadcrumbs. Maybe eggs. Maybe diced onions or peppers. And then there is institutional loaf. Hospitals. Schools. Employee cafeterias. It's probably made in giant vats by Sysco or Stouffer's. I'm not eating it. I'm not having it. I've never made it. Recently I was looking through Giada at Home which I picked up from the library. 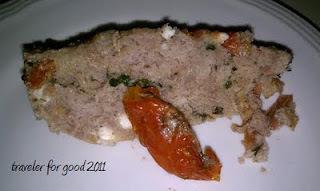 On page 120 is a recipe for "Turkey Meatloaf with Feta and Sun-dried Tomatoes." Sun-dried tomatoes and feta are a beautiful ccombination. The recipe only had things I like. On the opposite page in the cookbook is a picture of the finished product. And I felt better. Even a professional food photographer can only do so much with meatloaf. The recipe is savory with the salty bite of feta and the tomatoes. And my photo doesn't capture the taste. It just captures the fact that meatloaf is not meant to be photographed. Just eaten. On occasion. And probably only with feta. Preheat oven to 350. Spray a 9x5 inch loaf pan with cooking spray. In a large bowl, stir together the bread crumbs, parsley, sun-dried tomatoes, garlic, eggs, olive oil, feta, salt and pepper. Add turkey and gently stir to combine - do not overwork. Carefully pack into the pan. Bake until the internal temp is 165 - about 40-45 minutes. Remove from oven, let the loaf rest for 5 minutes. Use a paper towel to remove any fat on the surface. Enjoy.